Building a house has been a fascinating experience so far. It seems like every time I go to the construction site I am surprised by some detail that I had not expected – luckily, most of the time the surprises are good! There are things that have been clearly detailed on the house plans, and yet they come as a complete surprise when I see them installed on the house. Last week the chimney pots were installed. Chimney pots are pipe-like structures (made of clay, metal, or masonry) that can be added to the top of a chimney in order to improve the draft, and to add height to a chimney. According to Get Your House Right (available on Amazon here) they are also useful for keeping out rain and birds. I was not even aware that we were going to have chimney pots, although checking the house plans, they have been there all along. Driving around Atlanta this weekend, I was amazed at the number of chimney pots on the houses around town. There is a huge variety of styles, shapes, and sizes. A casual observation – most of the chimney pots seemed to be on the European style houses, not the classic Georgians or Colonials. Time is a bit tight these days to spend a day documenting the chimney pots in Atlanta, but the files on my computer provided many examples of this interesting architectural element. I was very surprised to see chimney pots on some of the homes that I had admired for years and analyzed extensively – I truthfully had never noticed the chimney pot. Case in point: this French style house designed by Stan Dixon, which I have posted on my blog quite a few times. Note the clay chimney pots. Here is a close up picture. Honestly, I had never noticed the chimney pots before! I like the style of this one very much. I tend to prefer the chimney pots that have a lip on the top. The house I had featured in my Halloween post also has chimney pots; in fact, each chimney seems to have several pots. This might be because there are two flues in these chimneys; each flue gets its own chimney pot. Here is a closeup, from some pictures taken during construction. I like this style too– simple, with a lip on top. Get Your House Right notes that a lip is important to give the chimney pot the right appearance. (This house was designed by Bill Baker, with construction by Benecki Fine Homes). Note the chimney pots on this charming house, with architecture by McAlpine & Tankersley. Image via Benecki Fine Homes, who built the house (and have worked quite extensively with McAlpine & Tankersley). A close up of the chimney pots. 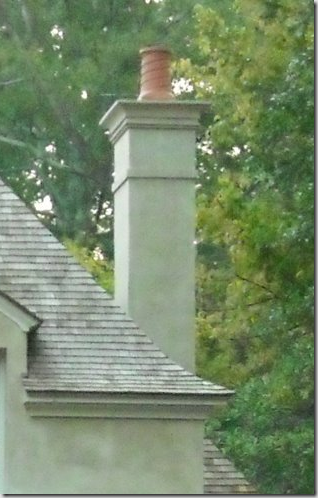 A house featured in my post on Tudor architecture in Atlanta has several interesting chimney pots. Another Tudor house featured on a post earlier this year has a charming chimney pot. Residential design by Bill Baker. 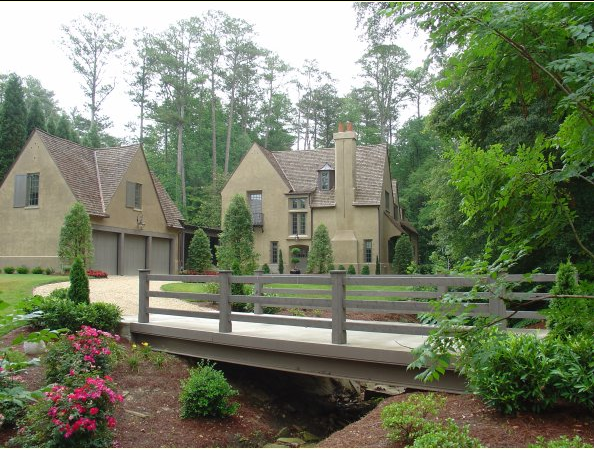 I drove by this beautiful house designed by Peter Block, and featured in Atlanta Homes & Lifestyles recently. Sure enough – a chimney pot. Photo credit Erica George Dines. Chimney pots are frequently part of Bobby McAlpine’s designs, including the cover house of his book The Home Within Us (available on Amazon here). Interestingly, these chimney pots are two different styles. Image via Cote de Texas. These chimneys have quite a few pots, with a large scale. They are definitely a defining architectural feature on this home. I read that one pot should be used for each flue – either this means that the house has 7 chimneys, or some of them are decorative. These chimney pots are from Superior Clay, which is one of the leading sources of clay chimney pots. Image source. One of my favorite French Normandy style houses has subtle chimney pots; I have looked at this picture so many times, and I never noticed them before! Architecture by Pak-Heydt. More chimney pots – very simple and subtle. Interesting that there are three on one side, two on another. Given the strong symmetry of the house, I like this small bit of asymmetry. Architecture by Pak-Heydt. I like how the chimneys are formed on this house. The two flues are each given their own stack, topped by a chimney pot on each. Architecture by Spitzmiller & Norris. Chimney pots come in all different sizes, scales, and designs – these small ones are very subtle, but effective. This French style house in Houston has rain caps on the chimney pots, which is not a look that I like very much. Checking out some chimney pots on the internet, it seems like ‘chess like’ styles are a popular option for certain styles of houses. Although these are a bit elaborate for me, I think they look charming on this old house in England. One of the sets are castles, the other crowns. Round chimney pots on another house in England. Looking through my pictures, I even spotted small subtle chimney pots on La Lanterne, the country home of the president of France (on the grounds of Versailles). Jack Arnold has European copper chimney pots in a variety of styles, for an alternative to the clay chimney pots. Now I see chimney pots everywhere I look. 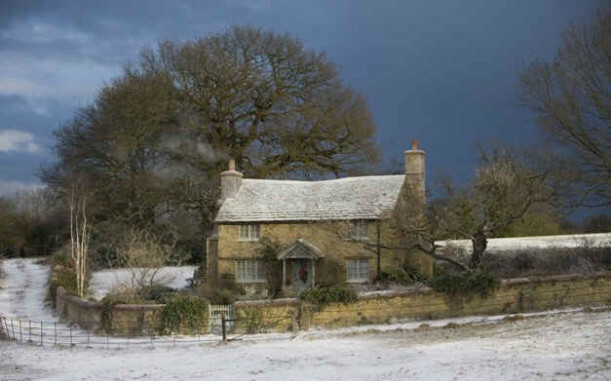 Hooked on Houses has a post on the English cottage in the movie The Holiday, and I immediately noticed the chimney pots on the house! What are your thoughts on chimney pots? Do you ever see these on houses in your area? Although chimney pots are an architectural design element that I never noticed before, I will probably always notice them from now on! I love chimney pots - I live in an old section of town and several english country and tudor homes that were built in 1920's and 30's have them. I have two old Chimney pots that I use in my garden as pretty decorative, garden elements. Your home is going to e stunning! I am so excited for you!! I love chimney pots. It seems that every architect we work with specifies them. It's especially fun to use antique ones and mix the styles on the same house (though Superior Clay is a great source for new). I have a "chess style" chimney pot that acts as sculpture in my garden. well,i can't say i've given them much thought - but the beauty is in the details and this proves it! these home are amazing and i think the chimney pots add that special touch. Great post. I think I'm sold on the clay chimney pot now, and agree that the lip at the top is key. Have you noticed the copper pots on top of the new French Brookhaven house with the great limestone entry? I believe they are the Jack Arnold pots. What lovely homes! I personally love chimney pots. When my parents finished building their home some years back, the last thing to be done was adding their antique copper pots to the chimney. They are such a charming detail, especially since they aren't in abundance. I so enjoyed this post about chimney pots!! I stared again and again to those gorgeous houses!! Oh my goodness, not only the chimney pots are wonderful, but the entire of the houses you showed here!! As I was reading your post I was wondering if you would mention Jack Arnold because I know he sells them on his web site and I think he has some wonderful ones. Isn't it amazing the things your eyes will just not notice when you are building a house. It scares me to think of the other things I have been staring at and never noticed. These are all such beautiful examples. I had never seen (or don't remember seeing) copper chimney pots before. I wish my house had a chimney, but our fireplace is gas. Maybe in my next place! Holly , Excellent article! !As you say, I am sure I will take notice of them all the time now and enjoy seeing the different styles! I must admit, I haven't paid much attention to these little toppers. But, you know I will know! Well researched!!! I have never paid attention to this detail of chimney design, but now I will! Thanks so much to opening my eyes to this great architectural detail. Great post. I loved the variety of photographs you featured. I think it is fascinating how when we are doing a project we 'see' things we never noticed before - when we re-roofed, ALL I saw when driving in neighborhood were roofs! I didn't even know what a chimney pot was.. what a wonderful post on them; now I will notice them and actually look for them! I love Chimney pots, but I prefer the copper ones. i love chimney pots. they make such an impact. could house number one be any more perfect? I hope you are happy: house stalkers everywhere craning their necks to see the top of chimneys, risking close calls with the Prius's, Mercedes,and joggers in the decorative pot neighborhoods. Down here in bungalow/craftsman territory we see a decorative band or 2 at the top of many chimnies with mostly utilitarian pots, if any at all. A few euro style houses have them. One more fun feature to look for. I spent many hours in Rome while studying abroad sketching chimney pots and other similar details. I have sketchbooks full of chimney pots! It's really a very subtle way to lend an authentic look to new construction. Even if you never noticed them before, the detail helps the house look "right." Love chimney pots!!!! That detail is very rare in the deep south, and I've only seen very few houses with them. Loved seeing the different approaches used. I especially like them with more than one pot atop the chimney! Thank you for the post! North Pelham seems to be the chimney post street in Morningside. It's almost a competition: small lot sizes mean you can the pots from several houses at once. They'd better be different. Yes, they also lengthen the chimney line to above the roof, which helps "draw" the smoke out. They are beautiful, so unique, they really make in impact. We can't find them here in Brasil. I just learned a lot about chimney pots while looking at the most beautiful houses!! It was SO wonderful to see your wonderful blog article about chimney pots! For the past nine years, I've had the good fortune to work with ChimneyPot.com, which sells both new and antique pots. They literally have hundreds of styles, and when you see some of those antiques 'in person' it's astounding how beautiful they really are. Both you and your readers would probably really enjoy the photo gallery on their website, as it shows chimney pots on a range of different houses, and also on outdoor fireplaces! If you ever have ANY questions, don't hesitate to call! (724) 345-3601. I'm all about chimney pots! Many of the 1930's era homes in my neighborhood have them. Mine sadly does not...but I want them so badly. But they are expensive so it will be quite awhile before I have them. I have friends who have them on their houses and don't realize it. I'm like..."you have great chimney pots!" What they'll say....I never noticed. Okay now I have to go look and see if we have chimney pots:) I never notice them either. Thanks for including our work in this great post! Thanks for mentioning our Jack Arnold chimney pots in your post. They truly are unique and beautiful--and a big plus is that they are not nearly as heavy as clay. Plus the covered top means that rain and pests won't get in the flue. Good luck with your home! Awesome blog about chimney pots. They are a upgrade to any chimney and the exterior look of any home. Two things to note is to make sure they have rain tops on them to keep out rain and animal guars on them to keep critters and birds out of the chimney. I am a Certified Chimney Professional in Dallas and Houston. My company takes many birds, squirrels, and raccoons out of chimneys with chimneu pots. Copper or steel pot toppers are a must on any chimney pot.